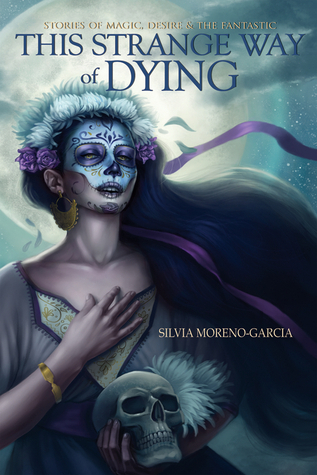 Spanning a variety of genres—fantasy, science fiction, horror—and time periods, Silvia Moreno-Garcia's exceptional debut collection features short stories infused with Mexican folklore yet firmly rooted in a reality that transforms as the fantastic erodes the rational. This speculative fiction compilation, lyrical and tender, quirky and cutting, weaves the fantastic and the horrific alongside the touchingly human. Perplexing and absorbing, the stories lift the veil of reality to expose the realms of what lies beyond with creatures that shed their skin and roam the night, vampires in Mexico City that struggle with disenchantment, an apocalypse with giant penguins, legends of magic scorpions, and tales of a ceiba tree surrounded by human skulls. Check out my review of Signal to Noise here! You should all know by now that I adored Silvia Moreno-Garcia's debut novel, Signal to Noise, and with her second novel, Certain Dark Things, not being released until October I turned to her short fiction for my next fix. This Strange Way of Dying is a collection of speculative fiction, much of which incorporates Mexico and Mexican mythology; I loved the Mexican setting in Signal to Noise, so I was really excited to read more stories set in Mexico, especially as it's one of the countries on my Travelling Bucket List. First of all: let's all marvel at that glorious cover. Isn't it beautiful? Something about short story collections really seems to attract pretty covers, which is great for shallow people like me who like to fill their shelves with aesthetically pleasing books. Even if this book were terrible I still wouldn't be able to fault that cover. Luckily, This Strange Way of Dying isn't terrible at all. I'll happily admit straight away that I didn't enjoy it as much as I enjoyed Signal to Noise, but I wanted to make sure I didn't compare the two all that much anyway because novels and short story collections are two such different art forms. In fact the only complaint I could make about the stories in This Strange Way of Dying was that some of them weren't long enough; a few I happily would have read even more of because I was so interested in Moreno-Garcia's characters. There are fifteen stories altogether in this collection, and there were five of them I particularly enjoyed; 'Bed of Scorpions' and 'Jaguar' were two of the stories I would have loved more of, particularly as they both featured women becoming empowered and gaining the upper hand in their respective situations. In fact women gaining the upper hand seemed to be a recurrent theme in many of the stories throughout the collection, such as in 'Shade of the Ceiba Tree', a dark and melancholic story steeped in folklore, and 'Bloodlines', which I especially loved because it featured witches. My favourite story in the collection, however, was definitely 'The Doppelgängers'; it was so creepy, but so well-written. I love Moreno-Garcia's imagination; she's one of those writers whose love for speculative fiction is clear, and now that I've read this collection I'm looking forward to reading her other collection, Love & Other Poisons, and her next novel. Basically I'm happy to read whatever this woman releases, and I'm so pleased I discovered her last year. If you haven't checked her out yet, you're missing out! Top Ten Tuesday | New to my TBR! My Most Anticipated Releases of 2016! Should We Write 'Bad' Reviews? Contemporary YA on my TBR!